Hurricane Sandy -- the storm that may transform into "Frankenstorm" -- is stalking the East Coast, raising the specter of extensive flood and wind damage to homes and businesses. 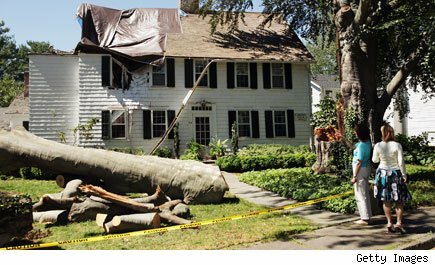 If you do wind up with property damage, proceed with caution -- you don't want to get hit a second time by home repair companies that jack up their prices, do a poor job, or walk away before the work is finished. In past years the Better Business Bureau has warned Americans about fly-by-night bogus contractors, "storm chasers" and door-to-door salespeople peddling dubious deals that may cost homeowners thousands of dollars and create serious headaches. Its advice is just as important now as it was when Hurricane Irene hit last year. Which is why we've gone back to see what DailyFinance reporter Sheryl Nance-Nash had to say on the subject in the wake of Irene. Any time you suffer storm damage, there tends to be a strong sense of urgency to deal with it -- but it's a good idea to take your time. In the wake of a major storm there will be a ton of people just like you, looking for help. Trouble is, some of the best contractors will probably already be booked with jobs that began long before the storm hit. And others are going to be snapped up quickly by your fellow storm survivors, so good help might be harder to find than you would anticipate. Run from any contractor who uses high pressure sales tactics or requires full payment upfront, as well as any one who requires you to get the necessary permits. How will you know a storm chaser? They appear uninvited at your door step, often in unmarked trucks, according to the BBB. Don't be surprised if they ask for big bucks up front and promise you the moon. Say no thank you politely, and close the door. According to the Federal Trade Commission, a deposit of one-third of the total quoted price is the norm. Pay by check or credit card, and pay the final amount only after the work is done and you're happy with it. Do not, repeat, do not, pay cash. "There's nothing wrong with giving a company a deposit on the day they start work, but do not pay $3,000 to $5,000 up front to secure a service for some date in the future," says Jeff Dundan, founder of AdvantaClean, a water removal company. "Does the company have worker's comp? What does its website look like?" asks Dundan. "If you can't find and validate the company online now, you likely won't be able to find them later. You hear the horror stories all the time," he warns. Is the contractor licensed, insured and bonded? If not, don't hire them. What kind of recent references can the contractor provide? Do ask whether the contractor will be subcontracting the job or will his or her crew be running the show. Find out what kind of organizations or associations the company belongs to. For example, the Institute of Inspection, Cleaning and Restoration Certification is a standards-setting body for the flooring inspection, floor covering and specialized fabric cleaning and disaster restoration industries. Its members are required to have proper licensing and liability insurance and to adhere to a code of ethics, and to employ trained technicians. If you get approached by someone offering water restoration services, you can ask to see the technician's official IICRC wallet card, which confirms training and certification. You can also call the IICRC hotline at (800) 835-4624 to confirm the certification of any company that has contacted you. As when dealing with other professionals, you'll want three or four companies to choose from. Get estimates and recent references before making a decision. Cheapest may not always be best. It's bad enough to have to make an unexpected repair; shoddy work will only be more expensive down the road. If you have to borrow money in order to pay for the repairs, think twice about using your home as collateral. If you can't pay it back, you risk losing your home. The FTC advises asking an attorney to review your loan documents. The FTC and the Federal Emergency Management Agency advise checking out anyone you plan to do business with through the Home Builders Association and Better Business Bureau for any complaints. And do get a copy of the final, signed contract before the job begins -- and make sure you read the fine print.